A complete guide to making Cookies for Christmas. Need Icing Bags and Food Gels? Cream the butter and sugar together until light and fluffy. Add the egg and the vanilla extract and mix through. Next pour in the flour and start to mix together with a spoon and once the mixture starts to come together use your hands to form into a smooth cookie dough. Place the dough into the fridge to chill down. Once its chilled flour your counter top and roll out the dough to about 1/2 an inch think and then using a cookie cutter cut out the required shapes. Use a piping nozzle or anything that will make a hole that is big enough to thread some ribbon through to hang the Christmas Cookies onto the tree. Make a hole in each cookie. Place the cookies onto a lined baking tray and whilst your oven preheats to 180C /350F chill the cookies for about 15 minutes or so. Bake the cookies in the oven for 10 minutes keeping an eye on them so they don’t go too brown. Once cooked remove from the oven and leave to cool slightly before placing onto a cooling rack to cool completely. When the cookies are cooled you can decorate them with royal icing. Get the kids involved and let them decorate their own. 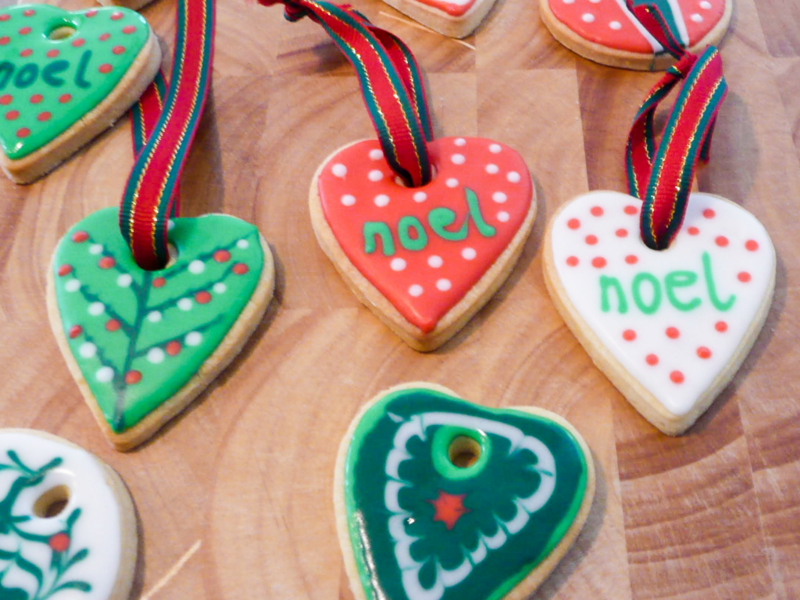 Allow the Christmas Cookies to completely dry before threading a pretty ribbon through the holes. Hang on the Christmas tree and Enjoy! !